We stayed at the Spook over Christmas and thoroughly enjoyed ourselves. Anthea had made sure we had everything we needed in terms of information about the village, walks, buses, pubs and eating out and shop opening times. The shop is incredibly well stocked with everything and anything including local produce and the village community staff are so friendly. There was milk, tea and coffee, biscuits and a lovely bottle of wine as well as other extras. The cottage is charming and the thoughtful multi genre library of books, games, cd's and films makes the holiday. We absolutely loved our stay and couldn't recommend it more, can't wait to go back again! We absolutely loved our stay in the Spook. 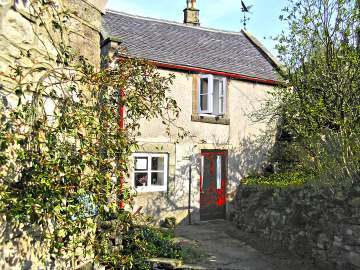 It is a charming little cottage in a beautiful village with winding narrow streets. The photos don't do it justice. We also had 2 fantastic meals in the pub just down the road. I couldn't recommend it more. I wanted to let you know that we really enjoying staying in The Spook. It's a quirky fun cottage but we felt really relaxed there. We will definitely be booking again and I will have no hesitation in recommending it to friends. I was a guest in Anthea's cottage, "The Spook" for a week in June 2013. The cottage is exceptional value for money - everything you need, and with plenty of room for a single person or a couple. It was immaculately clean, there was plenty of space, plenty of books to read, a very comfortable bed, and the garden, with its views of the village and surrounding countryside was also lovely. Anthea had thoughtfully left out local maps and guides, as well as biscuits, tea, coffee, milk and a bottle of wine for me. She was also incredibly helpful, even picking me up from the local train station, waiting when my train was delayed, plus offering me several lifts during my week's stay. She was also kind enough to invite me to join her and her friends in the pub one evening. I would thoroughly recommend "The Spook" to anyone wanting a relaxing week in Derbyshire. My fiancée and me both had a lovely stay at 'The Spook' It is situated in a beautiful old world village and has all the basic amenities of pubs and a well stocked village store. The house has everything you need, a great loft mezzanine double bed above the living room area and massive velux to look at the stars from as your sleep, also a great black out blind if you don't. The owners have made it a home from home with a great selection of books in a book wall and plenty of board games and so on. If you get restless, Ilam and Tissington are two great villages to visit for the day and have a walk around. If you need a week away in a homely cottage and plenty of peace and quiet, I would recommend coming to 'The Spook.' We will definitely be visiting again in future.